Patio pavers are the easiest way to obtain a hardscaped patio without pouring a concrete slab. 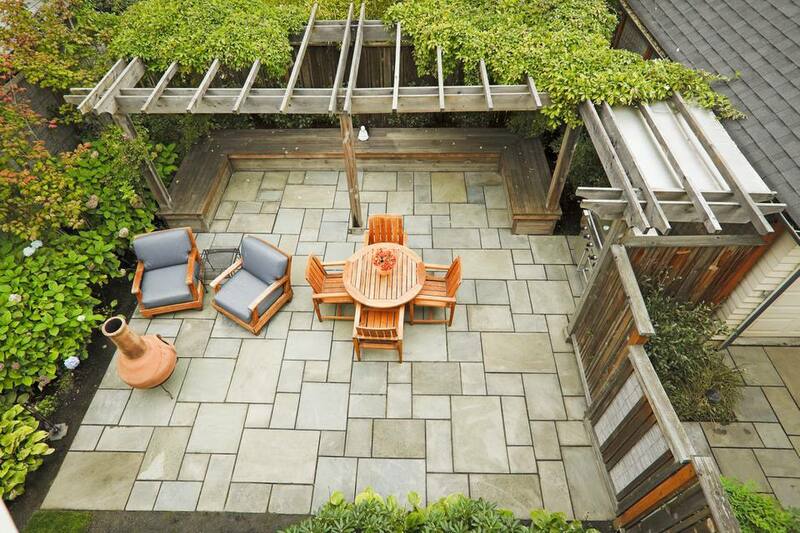 Patios are a valuable asset to any home's property. Nothing can be better than enjoying fresh air and a beautifully landscaped yard in the company of family and guests or simply finding quiet time to yourself with a book and a glass of wine. But you need a good, hardscaped place for all of this magic to happen. Dirt and grass are a poor surface for chairs and tables. Landscaping rock and pea gravel are economical and simple to install, but they tend to scatter. Concrete slabs are labor-intensive and expensive. But there is a compromise: patio pavers installed in conjunction with a remarkably handy product called polymeric sand. Pavers are the do-it-yourself patio paving solution that nearly any do-it-yourselfer can handle. But how do you manage the seams between the pavers? Dirt or loose-fill gravel are quickly infested with weeds. Exterior stone mortar effectively blocks those gaps but can be difficult for an amateur mason to apply properly. Polymeric sand is the seam-filler between the pavers that pours like sand but solidifies like mortar. The concept behind polymeric sand is that you will install the pavers on a sand and gravel base, then sweep the polymeric sand across the top to force the sand into the seams. All polymeric sand must be removed from the paver surface before wetting the pavers with water. The water reacts with the polymeric sand, forming a tight, cohesive mortar-like joint. Patio pavers are only as good as their base. You will need a 5-inch layer of crushed gravel or paver base, topped with a 1-inch layer of paver sand. The pavers rest on the sand, then polymeric sand is swept in the seams between the pavers. Your intended patio's width and length multiplied by the required material depths will tell you how much gravel base and sand to order. Site length and width (area) partially determine how many pavers to purchase. Your choice of patterns can increase or decrease that amount. Simple grid or brickwork patterns use the least amount of pavers, while complex patterns such as pinwheel or herringbone use more pavers. You may want to purposely size your patio so that you can use full-sized patio pavers and avoid the painstaking process of cutting them. If doing so, be sure to account for a 1/4-inch gap between the pavers. Drive a stake at each of the four corners of the intended patio site. Run the twine or string around the four stakes to form a square or rectangle. With your tape measure, measure two intersecting diagonals of your patio area to check for square. If both diagonals are the same length, your area is square (meaning, all four corners are at 90 degrees). Call your local Call-Before-You-Dig hotline to schedule a technician to come by your home and mark the ground for possible electrical, gas, sewer, or other sensitive lines. Speak to your local building permit office to determine whether you need to have a permit for this project. Dig out the perimeter of the patio area by first making a channel about 6 inches beyond the marking string. If cutting into the grass, it is helpful to use a landscaping edger: a flat, straight tool similar to a shovel that is capable of cutting straight lines in turf. However, you can use a spade, too. Dig a channel that is about 7 inches deep. Now, with the perimeter established, remove your marking string but leave the stakes in place. Remove the soil or turf from inside the perimeter area, digging down a full 7 inches. Place the unwanted materials in the wheelbarrow and dispose in a compost bin or in another part of your yard. Keep checking your depth, since you want to keep it as close to the 7-inch mark as possible. Snip any stray tree roots. Remove large or sharp rocks. Use your manual tamper or rented plate compactor to tamp down the soil in the patio area. Then roll out two layers of landscape fabric, with the top layer positioned 90 degrees to the bottom layer. Overlap the patio perimeter by about 4 inches. Put on your dust mask. Pour out about 2 inches of the gravel base material to the patio area. Spray it down lightly, then tamp it down flat. Add two more layers, each layer 2 inches thick. As you are adding these subsequent layers, begin to slope your patio area to promote drainage. The slope should run at a ratio of 1:4 (vertical to horizontal). Check the slope with the bubble level. Make sure that the slope runs away from the house. Your final bed is a layer of sand that acts as a soft place to set and adjust the pavers. First, roll out a layer of landscape fabric on top of the base gravel to prevent the sand from sifting through the gravel. In order to maintain a perfect 1-inch depth for the sand, lay down the two lengths of PVC pipe parallel to each other and about 6 feet apart. Pour sand between the pipes, covering them. Lay the scrap two-by-four across the tops of the PVC pipes, then screed it toward you in a gentle raking motion. The sand will move to the side and over the top of the screed board. Continue moving the PVC pipes and screeding until the entire area is finished. Finish by tamping down the sand, working backward so that you cover up your footprints. Re-attach the marking string to the stakes. Start your pattern at the edge of the perimeter, setting each paver stone flat into the sand base. Follow with a gentle tap with the rubber mallet or with the hammer and an intervening scrap of 2x4 to avoid breaking the paver. Continue setting the pavers so that they are 1/4-inch apart from each other. Be sure to keep adjacent pavers level with each other to avoid lippage, which can cause trips and falls. You may need to cut some of the pavers to fit the perimeter. If so, the least expensive way to do this is with a masonry chisel and hammer. After donning your safety glasses, score an establishing line on the paver face with a metal straight edge and the edge of the chisel. Draw the chisel across the paver in the same way you might cut cardboard with a utility knife. Remove the straight edge and use the chisel and hammer to deepen the groove to about 1/8-inch. Finally, position the chisel in the groove and lightly rap with the hammer down the length of the groove until the paver breaks apart. Place the plastic edging around the perimeter of the patio. Secure the edging to the ground by pounding the included spikes with the mallet or hammer, spacing the spikes about 12 inches. Sprinkle the polymeric sand over the top of the patio pavers, alternating by sweeping the sand across the pavers. Keep adding sand and sweeping until the gaps between the pavers are filled. Prior to adding water, it is absolutely critical that you remove all polymeric sand from the top of the pavers. If not, the sand will bond to the paver faces, marring them. Running a leaf blower is the best way to blow off sand without removing sand from the gaps. Set your spray nozzle on a light mist and spray your patio paver. Do not drench it with too much water; otherwise, you run the risk of dislodging sand from the gaps. Wait about 24 hours for the patio pavers to fully set. Cut away the overlapping landscape fabric with the utility knife.